Following my exciting discoveries in the papers of Francis Newbery, I have continued to catalogue the papers of the Directors of the School of Art and the next biggest collection of papers I have been working on are those of William Oliphant Hutchison. Sir William Oliphant Hutchison was the Director of the School from 1933-1943. He studied Art at Edinburgh College of Art from 1909 -1912, leaving to form the Edinburgh Group with Eric Robertson, A.R. Sturrock, G. Spence Smith, and D.M. Sutherland (later Principal of Gray’s School of Art, Aberdeen). He studied in Paris, and worked primarily as a portrait painter although he also exhibited landscape and figure paintings. Hutchison served in the Royal Garrison Artillery during the First World War, in Malta and in France, where he was severely wounded. In 1921 he moved to London and practised as a portrait painter, exhibiting regularly at the Royal Academy. He joined the Savage Club, and had a wide circle of friends, mainly connected with the arts. 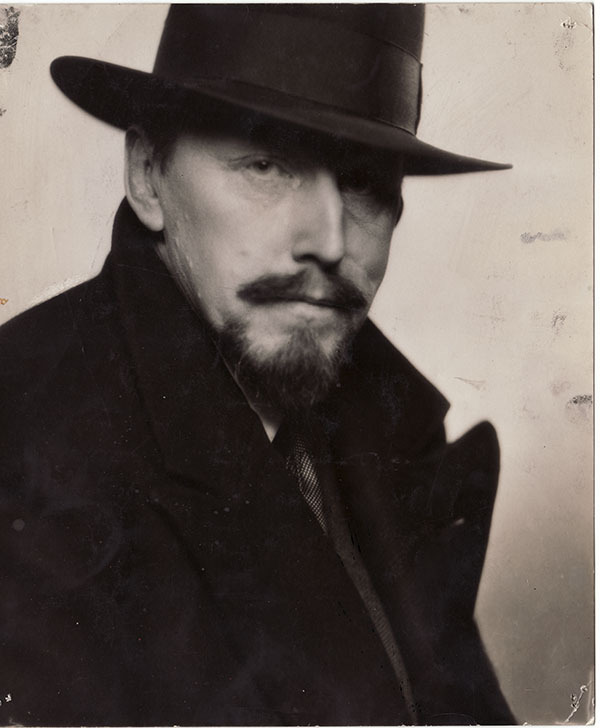 He was appointed Director of Glasgow School of Art in 1933 and guided the School through the pre-war years, overseeing connections between the School and the Empire Exhibition of 1938 and the first four years of World War II. Although he had had no teaching experience, he made an excellent director. He painted very much in the academic tradition but was always ready to help and encourage students and young artists who aspired to the avant-garde. 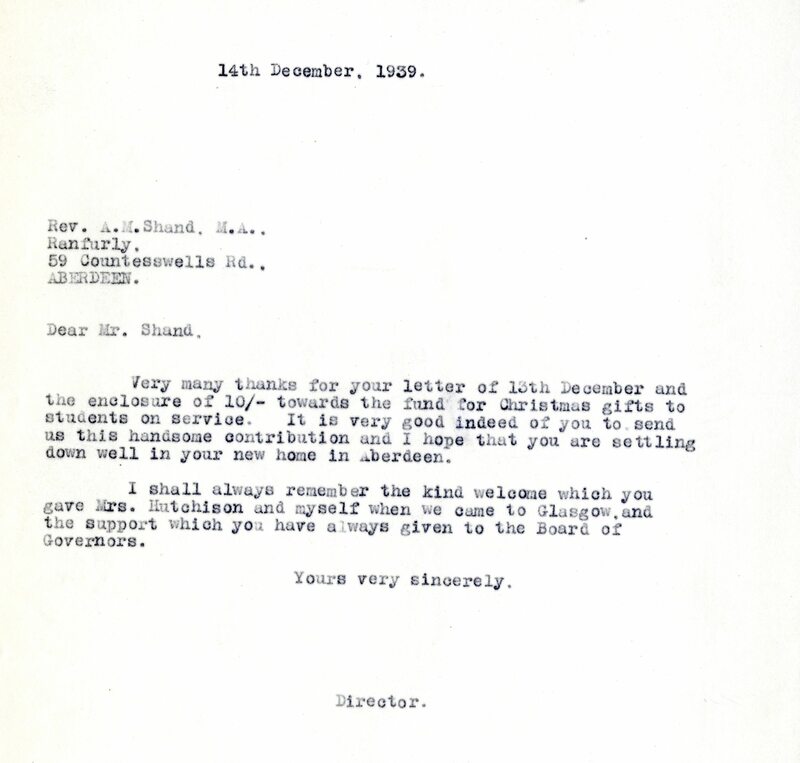 The papers of William Oliphant Hutchison mostly consist of correspondence filed in alphabetical order. I have been working through these letters, that span Hutchison’s decade-long Directorship, and providing a bit more information as to who some of the correspondents were and some of the subject matter. This process has been very enlightening and has got me imagining what a day in the life of a Director of the Glasgow School of Art was like. As you would expect, Hutchison corresponded with the other Art Colleges in Scotland, for example Edinburgh, Aberdeen, and Dundee, about their courses, degrees, wages, and training. He also received many letters from past students asking him to be their referee when job-hunting after graduation. Many prospective students, too, got in touch to ask his opinion on their drawing abilities and whether he thought they should apply to the Art School. Hutchison also had many contacts out with the Art School and was a member of Artistic bodies such as Glasgow Art Club, the Royal Scottish Academy, the Royal Academy and the Royal Society of Portrait Painters. 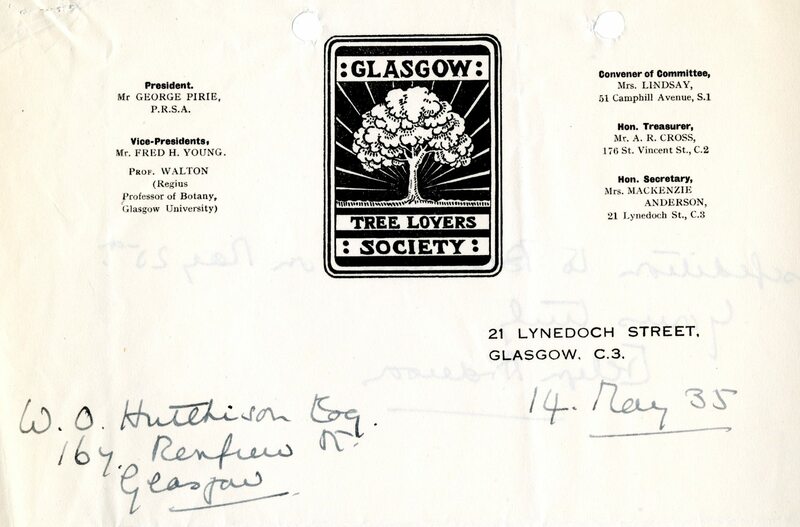 His correspondence records his subscriptions to these bodies as well as other organisations who wanted Hutchison to deliver lectures to their groups. He appears to have been very generous with his time and expertise, and gave lectures to societies and bodies including Paisley Art Institute, Kirkcaldy Museum & Art Gallery, the Scoto-Italian Society, the Adam Smith Club, and the Sino-Scottish Society on subjects such as Michelangelo, ‘The Position and Influence of the Artist to-day’, and Chinese Arts. 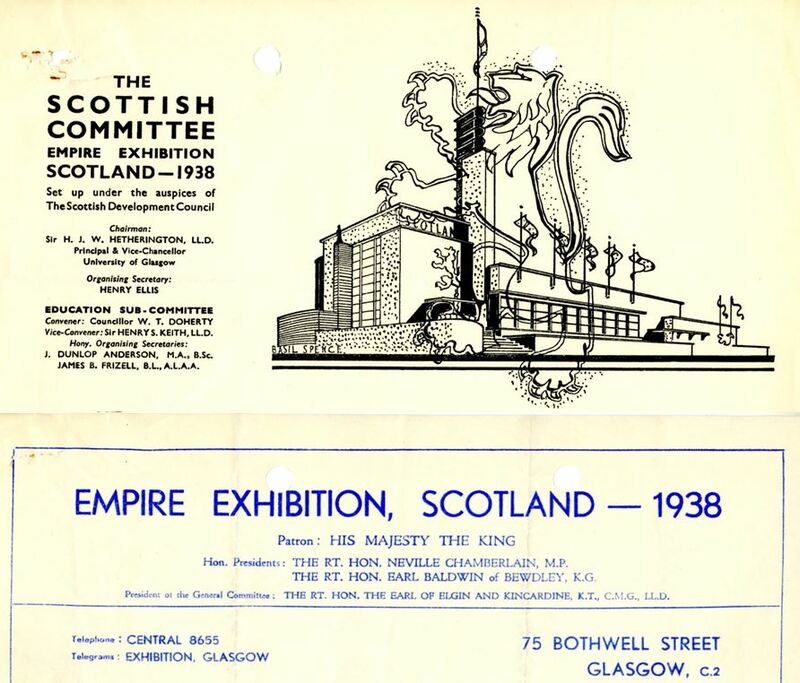 He was also involved in the Empire Exhibition, an international exposition of industry and arts in 1938, in Bellahouston Park, Glasgow and some correspondence files record his work for this project (DIR/9/62). Hutchison was vice-chairman of the fine art committee and was in charge of selecting examples of Scottish printing for the actual exhibition. He suggested that students decorate the pavilions, and school staff and students, including David Donaldson and Bill Crosbie, were involved in the poster and sculptural competitions. He also arranged that exhibition space be made available for the four Scottish art schools. The wartime letters themselves contain many personal letters of reference for students and staff, with a number interested in working in Camouflage. 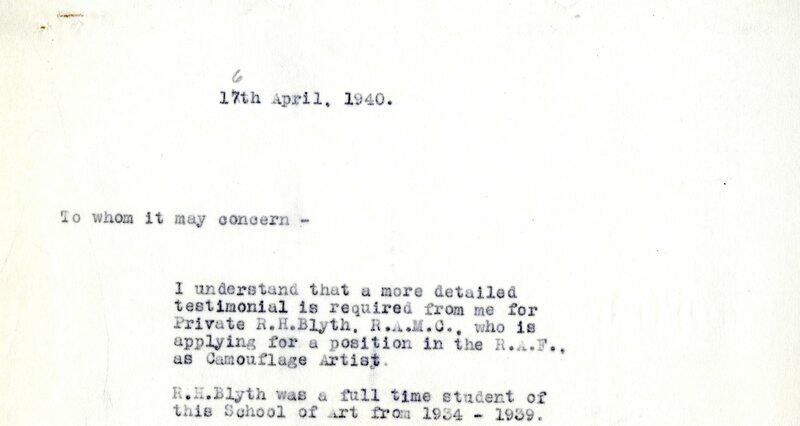 This period was a very uncertain one for the Art School, with shortages of canvases and paint, the requirement to build an air-raid shelter, and even repeated threats of the closure of the School! The School remained open, however, albeit at a reduced capacity, and Hutchison maintained a keen interest in the students and staff serving on the Armed Forces. He organised Christmas Cards and presents to be sent to them from the School. 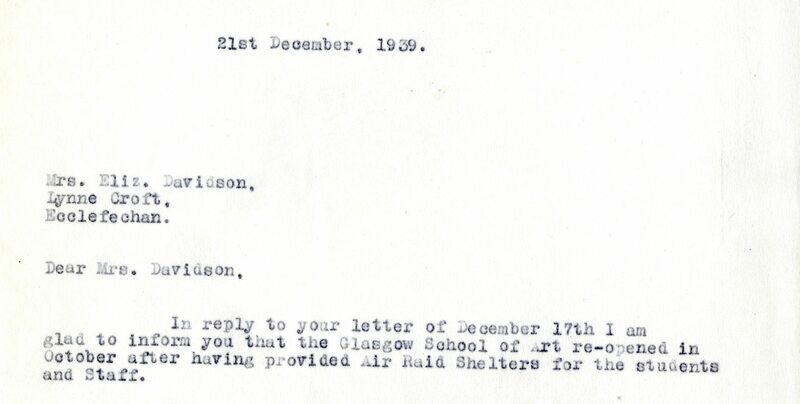 Hutchison further aided the War effort by allowing the British Red Cross some accommodation within the Art School. Hutchison’s correspondence is a fascinating and important snap-shot on the effects of the Second World War for the School and its staff and students. 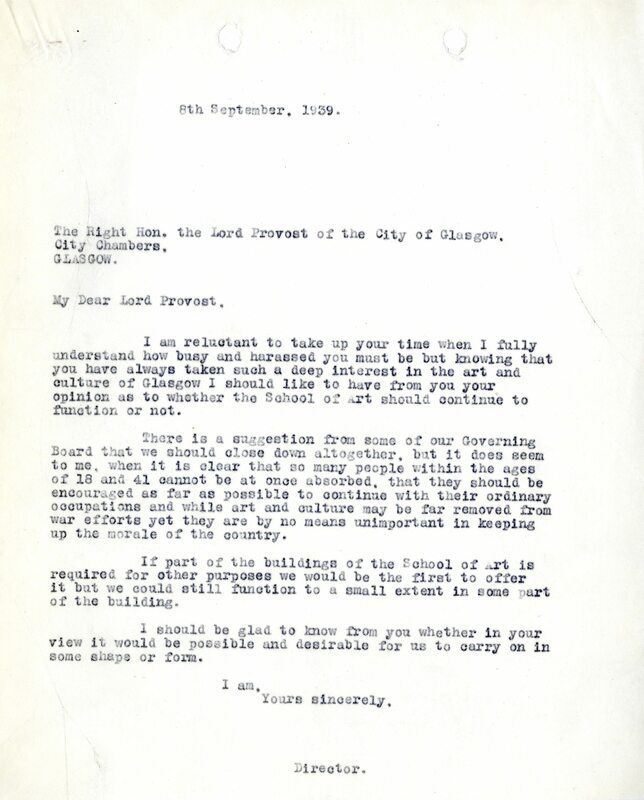 Find out more about Hutchison and his time as Director of the Glasgow School of Art by coming to see the letters for yourself! Just e-mail archives@gsa.ac.uk or phone 0141 566 1418 to make an appointment!